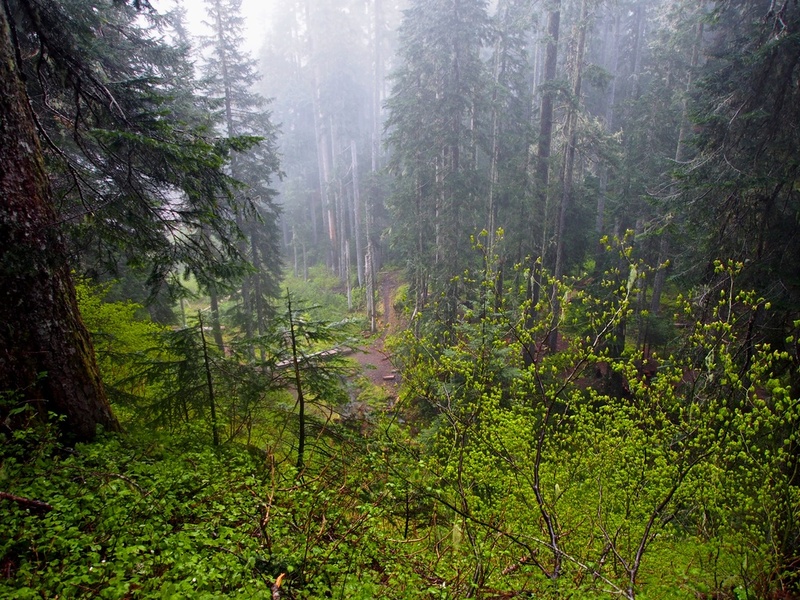 The first three miles of the trail were through old-growth forests. Over the 2014 to 2015 winter, I had decided I wanted to hike the full circumnavigation of Mount St. Helens in Washington State. The trek is completed via the Loowit Trail that has no official beginning or end point, but rather numerous entry points and exits along the 30-mile loop. Depending on where you access the trail, you'll hike right at or just beyond 29 miles. I'd never embarked such a long hike before and was able to recruit a co-worker of mine who gladly agreed to accompany me on the trip. While I had originally planned to do the hike over three days, we ultimately decided to knock it out in two. In order to distribute the miles evenly over the two days, we decided to hike clockwise around the mountain beginning at Blue Lake Trailhead on the South West side of St. Helens. We had chosen this direction because of a trip report I found online saying that you have an incredible view of the blast zone for about a mile as you walk directly into the crater on the North side of the mountain. I thought this was a great idea, so we made the plans and hit the trail. The Toutle River crossing isn't too bad but you'll have to find your way across the river and to a rope that leads you up the east side bank. You'll want that rope as it's pretty steep. As always, we watched the weather forecast leading up to the trip and as with all things PNW, it looked as though we were going to get rained on, but that wasn't going to stop us. We hit the trail that morning around 6:45 AM and quickly found ourselves making great time as we made our way to the Toutle River crossing. The clouds were certainly low that morning but we figured they might break at some point during the day so we just kept our heads down and waiting for the fog to lift. While some may think hiking in the fog isn't much fun when you know there are incredible views to be had, there is still something special about it. You know in your heart you should be looking at an expansive vista, yet you find yourself forced to focus on what is in your immediate environment. It's like Mother Nature is forcing her hand on you by making you appreciate something you didn't exactly come for. Fog everywhere. There were elk tracks running all over the mountain yet we couldn't see any of them. I'm sure they were just around the corner. For those of you who don't know much about the trail, you cannot camp anywhere in the blast zone on the north side of the mountain. This means you must make on the west side of the Toutle River or the east side near Windy Pass. This is about a 10 or so mile stretch that you must make in one day, so you'll need to plan accordingly. We made it to the Toutle River in great time and began our trek across the blast zone with time to spare. The thing about the PNW is you never really know what you're going to get. We expected rain and received none, expected to see the mountain and saw nothing. We hiked the entire north side of St. Helens without once seeing what we came for - Madam Helens made no grand appearance. The most common vista on our hike that day was watching the clouds roll through the blast zone. One cow elk was spotted trotting along a ridge at one point and when we stopped for lunch, we were able to enjoy a view of Spirit Lake down in the lower valley. Needless to say, our hope of looking directly into the crater during our hike was a bust. The fog was so thick at times that we couldn't even see a waterfall that was no more than 100 yards in front of us. The entire hike was a mystery to us. We knew there was something amazing to see through the fog, but we were never allowed to view it. By the time we reached Windy Pass, we were pretty tired. The Loowit Trail is not exactly easy walking as it's made up of lots of small rocks and ash that either make you feel like you're losing the ground your trying to gain or you're walking on ball bearings. It's a great hike, but it's a tiring one. Windy Pass required a near vertical hike up and a vertical hike down into the Plains of Abraham. Don't let the view fool you, right behind me was a clouded summit view of St. Helens. This is me looking down into the Plains of Abraham. As we headed down the east side of Windy Pass, we saw our first views of the mountain. I hurried and snapped some pictures, but the moment didn't last too long. We camped on the west side of the Plains of Abraham and were blessed that evening with an incredible view of the summit. Various hikers were camped throughout the Plain, which made the whole scene quite interesting to gaze upon. In the 13 or so mile stretch of trail we just hiked, we saw towering old-growth trees, the lunar-type landscape of the blast zone, and the Plains of Abraham that look a lot like the planet Mars. The next morning, we were greeted by a beautiful sunrise that lasted until we packed up camp and made our way down into the south side of the Plains. Once at the lower elevation, we were quickly engulfed in a thick cloudbank, which cut our visibility down to mere yards at times. We passed Ape Canyon without ever knowing it was there and had to think pretty hard about which trail to take each intersection we came upon. Visual references were nil in the fog. We were following a trail that continually led us from one fog bank to the other. Any viewpoint along the Loowit offered did not exist to us. Looking Southeast into the Plains of Abraham. This side of the mountain is incredible to gaze upon. The Muddy River washout area was next on the list of fun. We spoke with hikers going counter-clockwise and knew it could be an interesting passing because the trail was not yet well established after the winter snow. We slowly made our way down into and out of each washout with no issues and eventually to what I could only guess was a nice meadow. From there we descended down into June Lake through what seemed like some sort of dragon layer made of large boulders and rolling clouds. We never made it to June Lake but rather followed the trail above it through about a mile of boulder hopping. This section of the trail is no joke. After two days on the trail, hopping from boulder to boulder for a mile is quite tiresome. More often than not, the Loowit Trail is not actually a trail, but rather a series of large posts driven into the ground that guide your way around the mountain. It's fun, but it's tiring on the legs having to find your way over rocks and boulders. Rock hopping for miles! Large wooden posts like the one in the upper right of this image keep you on track. After the boulder field, we made our way up a large hill to more boulder fields. By the time we made it to Butte Camp Dome just above June Lake, we were pretty smoked from the day. The last few miles of our trip would be down hill and through the forest. This section of the trail was amazing. 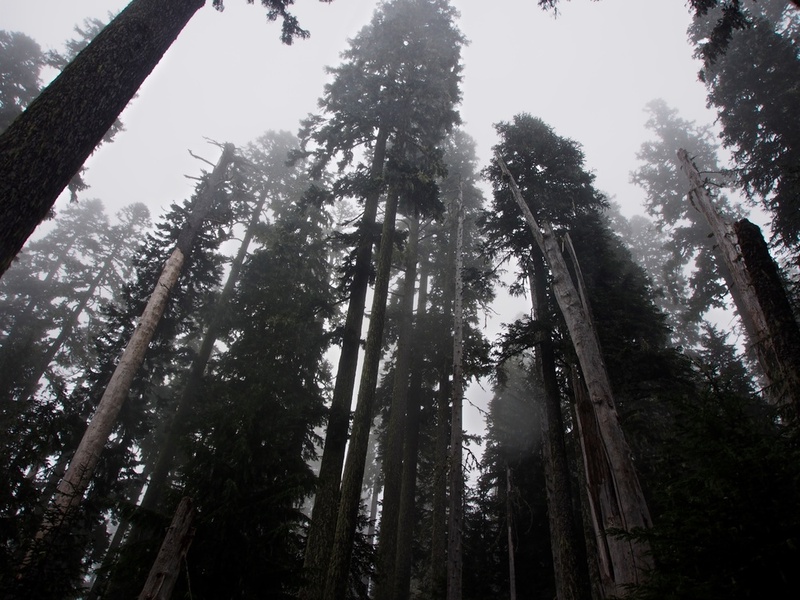 Towering trees, steep hillsides, and lava beds were found to be quite the scene. By the time we arrived at the trailhead, I was exhausted. I tossed my pack in the truck and we headed home where I soaked in a hot bath and had a beer. For the next two or so days, I walked around the house like an old man and wished I had been in a little better shape for the two day trip but was still glad I did it. Looking back on the trip, some might say that it was a bust because we hiked over 30 miles through fog. I may have agreed with this idea a few months ago, but ask me that today and I will happily tell you it was a very special trip. I've since returned to the Loowit Trail on sunny days and experienced the views that I missed out on. 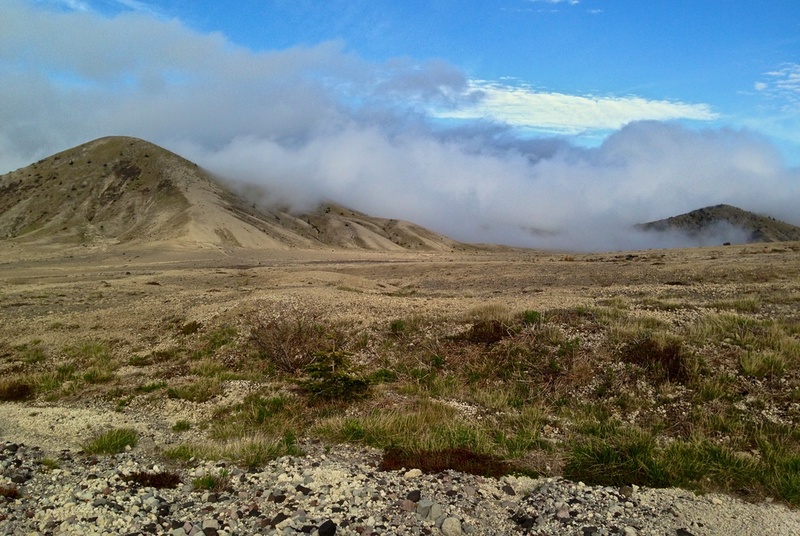 What I noticed on these trips is that the sections of the trail that I experienced in the fog were not the same as they were with blue sky above me. I've learned to love this about my Loowit Trail experience. It's as though I walked an entirely different trail than most have because of the weather I experienced. Each rock was bigger in the fog, each gully deeper and more mysterious, each turn of the trail a new adventure as I wondered what was around the next bend. My Loowit Trail fog walk was no doubt an adventure and one I wouldn't trade for the world. The great thing about the outdoors is it's always there for you to go back to. I certainly plan on going back for another trip and though I wouldn't mind doing so in the fog, I'd like to see the mountain at least once or twice. 1. You cannot camp in the blast zone on the north side of the mountain and you must stay on the trail. The area is so delicate that it needs to be preserved as much as possible. Every small shrub you see is struggling for life and it's very apparent. Please help take care of this beautiful mountain by sticking to the footpaths. 2. There are washouts on both sides of the mountain. One at the Toutle River (west), and a couple over by the Muddy River (southeast). If you plan to go early in the season, take them slow and make sure your footing is solid before taking your next step. Late season hikes are no issue as the trail has already been formed. 3. Water is scarce so plan accordingly. There are a few streams here and there but they're pretty cloudy and few and far between. When you see water, scoop it up and take advantage of it. Late season hikes will be worse especially if our summers in the PNW continue to be more on the dry side. 4. The trail isn't always a well-defined path. You often follow posts or stacks of rocks to the next section of trail. Be aware of where you are and always be looking for the next stack or post. 5. Watch your step, the trail is full of loose sharp lava rocks. One false step could be pretty bad. Take your time and bring trekking poles for balance. Poles help out immensely on the rock hoping portions. 6. Two days is doable, but three would be perfect. If I were doing a three day trek, I'd start at June Lake, camp at the Toutle the first night and the Plains of Abraham the second. Our two day trek meant roughly 13 miles the first day and just nearly 17 the second. We began and finished at Blue Lake Trail Head while camping one night at the Plains of Abraham.